Blue Water Lift & Dock, Inc. is a ShoreStation authorized dealer and a certified dock system installation company. Blue Water Lift & Dock’s primary goal is to provide our clients with quality service and products for all their dock and boat lift needs. Our 40+ years of experience in waterfront design and service will create an attractive and very functional lake front living environment. Address: 265 N. Maloney Dr.
ShoreStation Classic Sectional Dock welded deck sections are available in your choice of Low Maintenance Aluminum or Nostalgic Cedar. All hardware and component parts are constructed of the highest quality materials. From the galvanized steel leg frames to the stainless steel cotter keys, everything is designed with durability in mind. The roll-in and free-standing support systems feature screw-adjust legs allowing for quick height adjustment for different depths or changing water levels. Adjustments are easily made without ever stepping into the water. Nothing can match the lasting beauty and durability of western red cedar. These sections feature only the finest, beveled-edged cedar planks with matching side-boards for a sturdy, traditional look. Whether you choose to stain your dock, or leave it unfinished, you’ll be amazed by the durability of this natural wonder. The Classic Sectional Dock is the most versatile style and perfect for almost any type of lakefront. The foot pads on each of the legs that simply rest on the lake bottom. 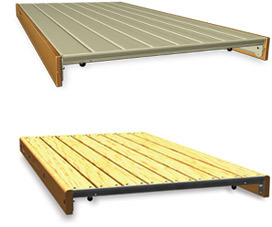 This allows the dock to work in difficult situations such as steep drop-offs and rocky, uneven bottoms. The various leg frame and extension leg combinations allow it to work in water up to 12′ 4″ deep. The versatile, modular design of Genuine ShoreStation Dock makes it easy to create thousands of different layout options. These diagrams illustrate just a few of the possibilities. Mix and match 4′, 6′ or 8′ widths. Use 2′ Catwalk sections for adding narrow walkways off a main dock. We take pride in working with our clients to design a custom waterfront dock and watercraft lift installation. Our product selections only include items from manufacturing companies that provide high quality products like ShoreStation. We provide a variety of options to fit your needs from jet skis to large boats and everything in between.